The Boston Symphony Chamber Players opened their Sunday afternoon concert in royal fashion with a quintet of J.C. Bach, and then took a leap into the 20th century with an early, artful work of Boston’s Walter Piston. Continuing on with their rather odd program, Hindemith’s sonata for double bass certainly felt at home in Jordan Hall, while a Hollywood-esque piece for horn and electronics by Jeremy Flower did not. Finally, with a Beethoven string trio came some normalcy. Several of the audience members noted the exceptionally large number of empty seats. Could it have been the programming? Scrolling through the Upcoming Events section here in the Boston Musical Intelligencer, it could perhaps have been the sheer volume of musical events taking place in Boston at pretty much the same time. Expectation, though, on the performance side of the concert was fulfilled and then some. BSCP preserves its good-looking-ness on stage, its consummate presence, and, most of all, its unsurpassed musicianship. And this goes, as well, for its guest musicians. J. C. Bach’s Quintet in G Major for flute, oboe, violin, viola, and continuo, Op. 11, No. 2, appeared aristocratic over its two movements. Rowe, Ferrillo, Lowe, Ansell, Eskin, and guest harpsichordist John Gibbons eloquently synchronized the simple harmonies, jolly melodies, and impression-making rapid passages, but brought still more to this historical sound-picture. Was this not the time of manners and courtesy blossoming? BSCP persisted brilliantly in purveying such. Later on in the program, we would come to the Beethoven and hear what a different take that composer has on life and on his contemporary culture. So, the program’s “oddness” did, in fact, make some sense; this, through a compare and contrast lesson, no words, all music making. At 31, Walter Piston was in Paris studying with Nadia Boulanger when he wrote his Three Pieces for Flute, Clarinet, and Bassoon. Each followed an ABA form. Rowe, Hudgins, and Svoboda expertly enlivened a New Englander’s reserve. Rhythmic motives danced as much as it seemed they could. Tonal intricacies found enunciation though Piston’s early tonal language could be elusive to this listener. Altogether surprising and most enchanting—yes, I mean that—was Paul Hindemith’s Sonata for Double Bass and Piano. I imagine listeners like myself found themselves having to adapt to fewer decibels and to lower frequencies. Sitting high up in the balcony, not every note from Barker’s bass was audible. But never mind that, Barker cornered our attention with his huge instrument. No, it was not an oversized cello sound, it was a Double Bass speaking lyrically and animatedly. Ears focused in on one of the biggest creatures of the western instrument world, and it was sheer delight. And the delight was heightened four times squared with Hodgkinson at the piano. He knows his way around the 20th century like very few others do. Ever aware of his power, he nevertheless had the piano speaking as though it were in normal surroundings. Exquisite enchantment is an apt description of what they did with the Hindemith, the German who is not infrequently described as a pedagogue. Not much can be said about the ten-minute work, Shamu and Clinical for horn, laptop computer, and piano. People were still conversing when headache inducing bass rumbles began wafting through Jordan Hall evoking shhh’s from a very few of few concert-goers in attendance. Sommerville had little to do, often just standing and waiting. The program note, “Things shift slightly and subtly throughout” alerted to minimalism. When Sommerville did play, it was basic stuff, “white keys” is the old expression. How so popish and non-substantive a composition as this made its way onto a BSOCP program is beyond me. String Trio in G Major, Op. 9, No. 1 turned the tables. 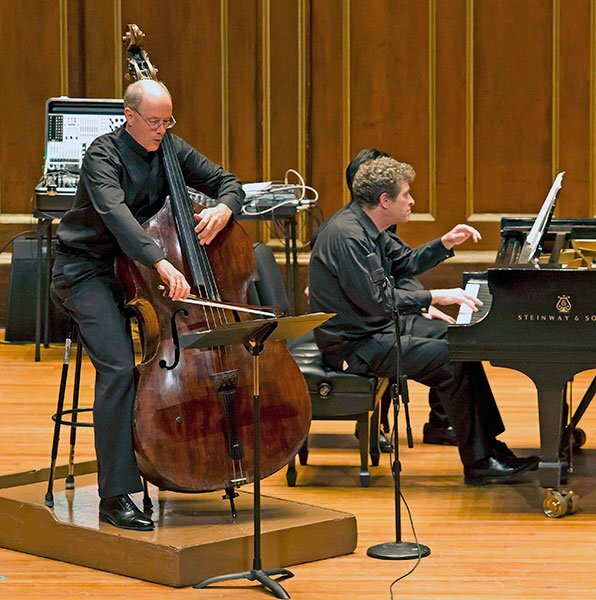 Lowe, Ansell, and Eskin never looked up, so immersed were the three in this work of Beethoven. Noting that Lowe quickly turned multiple pages at the start of the last movement suggested that he had played the third movement from memory. Could that be? Through all their refinement, ever emerging was that Beethovenian expression of humanity and the new freedom, completely, concretely posed by that crew of magnificent players. Beethoven’s truths were made “visible” through BSCP. What we heard was reality, not just an idea or musical fancy. The lack of many attendees at the Boston Symphony Chamber Players concert may have been because the Claremont Trio was playing to a sold out hall at the exact same time at the Isabella Stewart Gardner Museum.